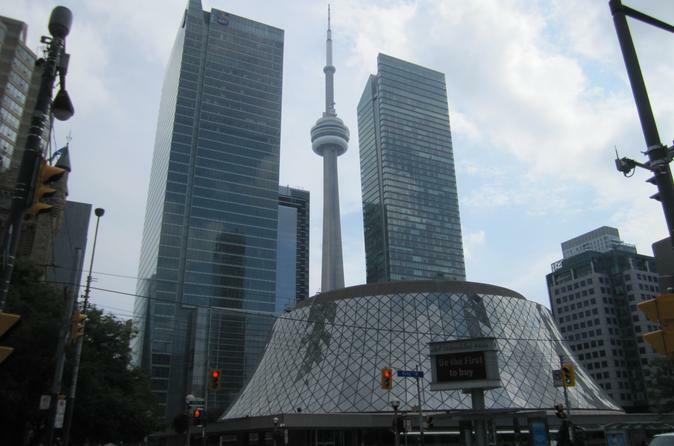 Enjoy a private tour of Toronto for up to three leisure or corporate travelers. Discover the architectural marvels that made Toronto famous throughout the world, such as the CN Tower, Rogers Centre, Royal Ontario Museum, Art Gallery of Toronto, Toronto Entertainment District, Distillery Historic District, Yorkville, St. Lawrence Market, and Harbour Front. On this 2.0-hour private tour, you'll drive by Toronto’s famous CN Tower, Rogers Centre, Hockey Hall of Fame, and St. Lawrence Market. The tour will then continue to the Historic Distillery District, where you will stop and discover this unique heritage space - also known as Canada's largest centre for arts and culture. Hop back into the car and continue to drive by the Eaton Centre, Old and New City Hall, Art Gallery of Toronto, China Town, Kensington Market, Ontario Parliament, Royal Ontario Museum, and Yorkville with its high end stores, boutiques and restaurants. At the end of the tour, your guide will take you back to your hotel or a preferred restaurant for lunch or dinner.